As a yard drainage contractor, you see a lot of different things. But one thing that I see as a repeat is what I have here. We got downspouts on the side of the house. One behind this Evergreen, this Arborvitae. Everything is forced, the water to be bottlenecked right here. They put some privacy screen up on the property line. Everything drained real well until that happened. And it’s just been trouble ever since. What we’re doing is we’re getting the water out of the side of the house and helping these downspouts as well. This pop-up emitter is a downspout and it’s not tied into our French drain system. It’s just a pipe in the trench with the French drain pipe. The French drain pipe is then taken out to the backyard where we have enough fall to where we can empty the bottom of the trench in between the two homes. The water will start leaving the French drain system as soon as the French drain system in the backyard is below the bottom of the trench, on the side of the house. The water will actually come up through the French drain system and up through the sod And then on heavy, heavy rains, the pop-up meter will start admitting water as well. 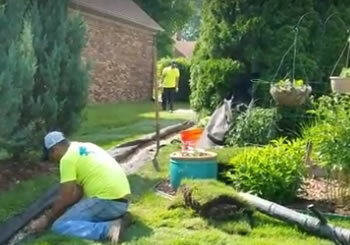 For experienced yard drainage contractors in North Oakland and North Macomb County, give us a call 586-752-2200.